I thought that I’d share some of my most recent work in 1/1000 StarFleet ships. My primary area of interests in Trek has been TMP Era and The Lost Years Era of Designs. I don’t exacy why, other than I like the less stringent and somewhat “dirtied up” look of the ships not being completely austere, externally. Maybe it’s just a standard male visual thing and I like the “cleavage” that the TMP and LY Eras have. Anyhow, off to the meat of this thread, a few I’ve assembled over the last couple of weeks. USS T’Pol, NCC-1975, Endurance-class frigate. She’s named for the character from ST:ENT, registry is the year that Jolene Blalok was born. USS Hunter, NCC-1419, Shanks-class light cruiser. A kitbash from the Jackill’s design. USS Ascension, NCC-2520, Ascension-class dreadnought. 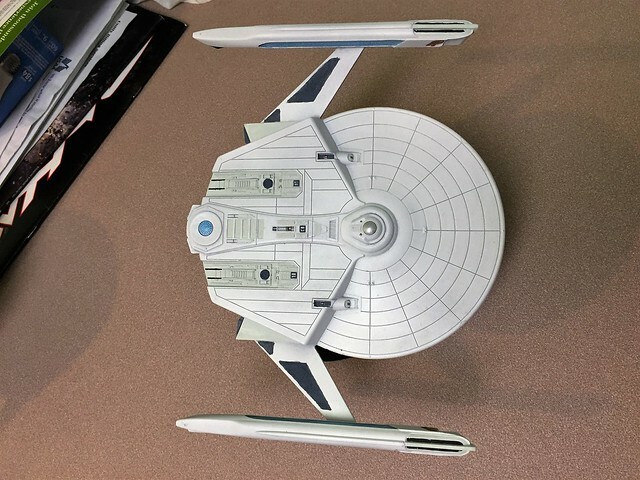 Essentially just a Belknap with an extra nacelle added. Well, and MEGA!phasers. USS Belknap, NCC-2501, Belknap-class strike cruiser. Straight build, nothing extra kewel. Here’s my most recent build, and my take on the Refit Federation-class dreadnought. 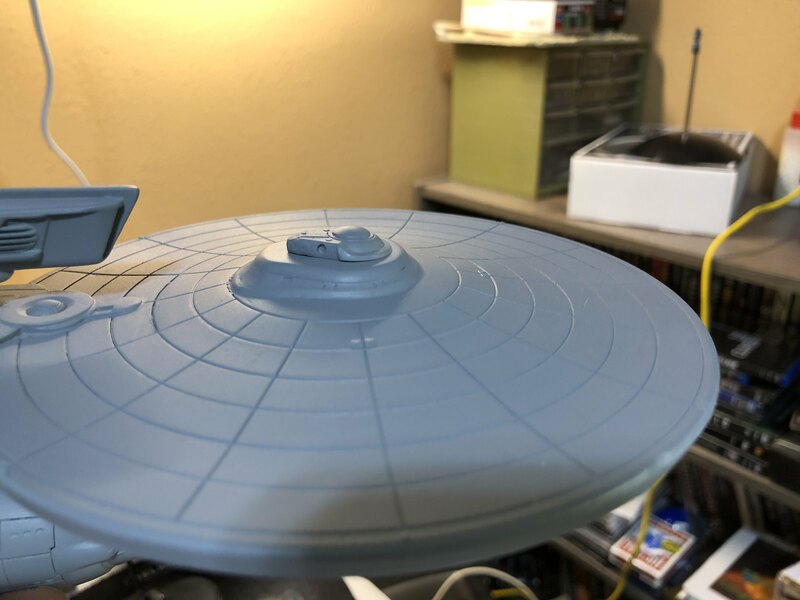 She’ll be USS Dominion, NCC-2115, and I’ve already got custom decals for her. The Dominion is my most recent, tho I’m still in need of a mold I made to fully cure so I can add an Abbe-class bridge and MEGA!phasers. And I’ve got several other pics I’ve not shared here yet. Last edited by Griffworks; 03-31-2018 at 04:59 PM. Very nice. Where did you get the Endurance parts? Hopefully by the end of this coming week he'll have them all good! Last edited by Griffworks; 03-24-2018 at 07:22 PM. Trying. The sweep function on my CAD program is all fouled up. I did get a few new Excelsior necks done, but not much more. I so need a new computer. I like that kitbashed Designs. That is always the painful and boring part of ihr hobby. Last edited by frostrubin; 03-24-2018 at 11:00 PM. Thanks, Fellas! And sorry to hear about the PC issues. Hopefully, it can be resolved. Do what you gotta do, tho! Can't always help when technology betrays us. 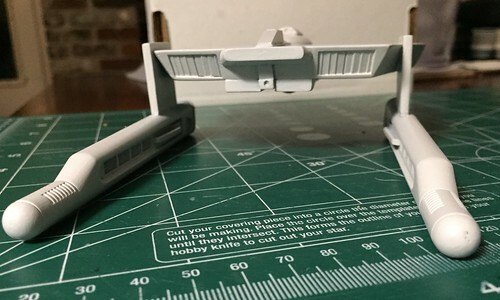 Now with 100% more scratchbuilt bridges in 1/1000 scale! Obviously more work to come! Most times I do, too. It's just that on occasion, it gets so danged frustrating! 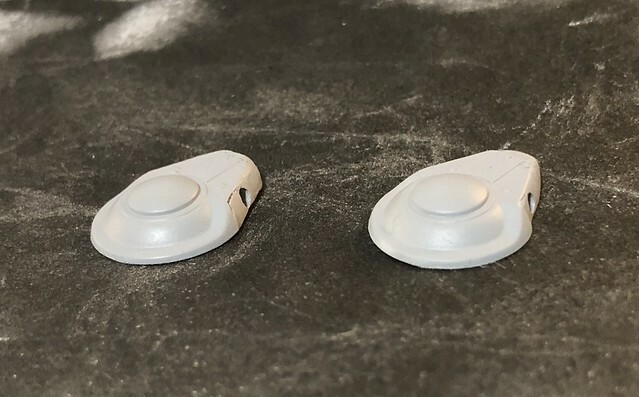 Showing a Federation Models dreadnought bridge installed on another build and on the left, my scratch-bash on the right. More pics of the Dominion build. Both bridges on their second coat of primer. It's amazing how much the camera really shows you, innit? I really like how this shows off the profile of my version of the bridge. More pics of the bridge parts. A few more, tho these are all older builds. I think I might have shared them a while back, but don't recall which I might or might not have. Plus, I've just created Albums on Flickr for them, so figured I'd share them here, now. First up is the USS Daran, NCC-3201, lead ship of her class. It's modified from the original design by Todd Guenther, so not a true representation of Todd's original work. Pics in the Daran, NCC-3201, on Flickr. Overhead view, which shows off her different back end from the original design. Showing the navigational deflector and leading edge photorp tubes. 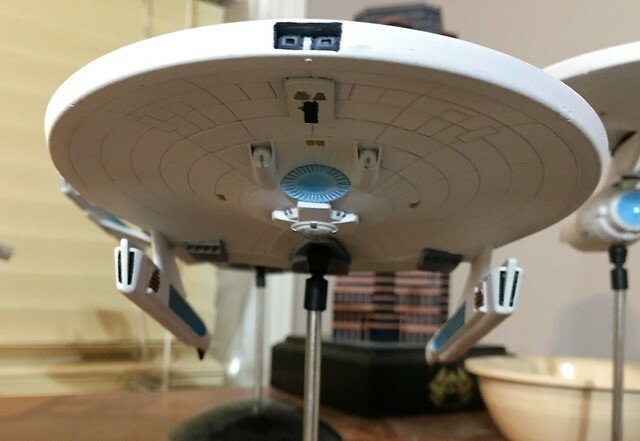 Next up is the USS Potemkin, NCC1711, and Enterprise-class heavy cruiser. She's also got LN-68 Mod 3 nacelles, as well as the split impulse engine deck that also gives her a pair of aft firing photorp tubes at that location. More pics in the album on Flickr. During construction showing the Abbe-class bridge. This next is the USS Eagle, NCC-1969, a Peregrine-class frigate, based off a design by John Payne. Eagle album on Flickr. Overhead view of the design. 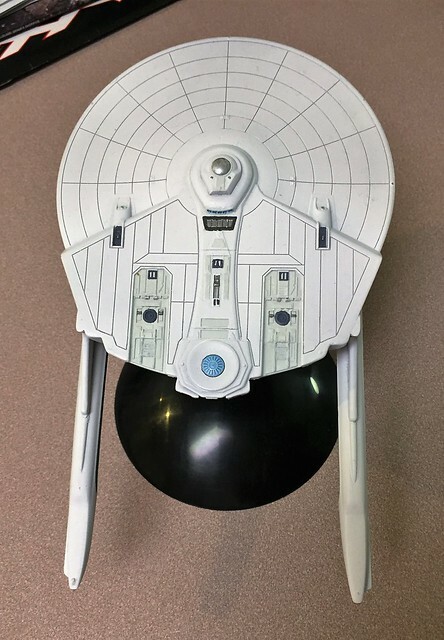 Showing off the lower saucer mounted navigational deflector and leading edge photorp tubes. Nice! Rally like the Daran! This is my USS Socorro, NCC-1231, a Coventry-class frigate. The primary hull is resin that I received from a trade deal with a friend several months back. 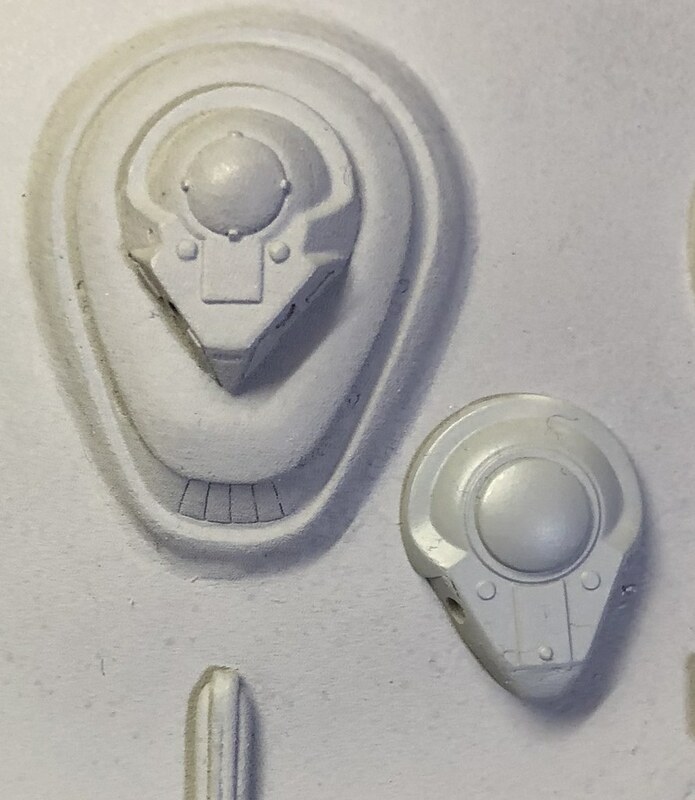 It's from Modular Models, whom has a pretty poor reputation for taking entirely long times to fill orders - some folks I know of have been waiting around a year now - rarely answer emails, have sent out poor quality castings, and/or are rude when they do reply to an email. Or in my case, to questions I asked on their FaceBook page - I asked what the expected wait time might be if I ordered two Balson-class secondary hulls and a couple of other parts. At first, I was pointedly ignored even tho there was a reply after my post within the thread, and then received vitriol-filled responses when I further inquired, which went to Messenger and become ever-incendiary in tone. I say all of that to state that I was very fortunate both to get this hull as I did in a trade, and that it was of very nice quality. 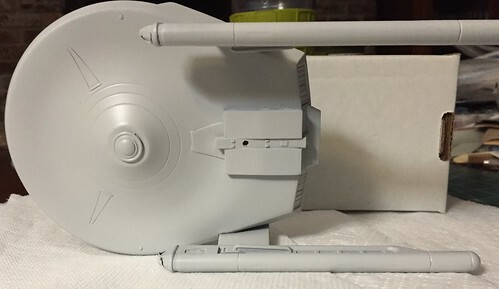 Anyhow, when these kit parts came out from Modular Models, I wasn't into Trek at the time, and definitely not in 1/1000 scale. There were very few kits in 1k at the time and my prediliction rain towards 1/2500 scale. After the Reliant kit was released in 1/1000 from Round 2, tho that changed my mind. By that time, tho, the issues with MM had started up and I wasn't about to potentially lose money or at least get my blood pressure up by having to dink around with MM - both with their poor customer service reputation and acidic replies. I decided to make this a variant on the basic Coventry-class design. I'm inclined more towards TMP Era, as well as early Lost Years Era designs. 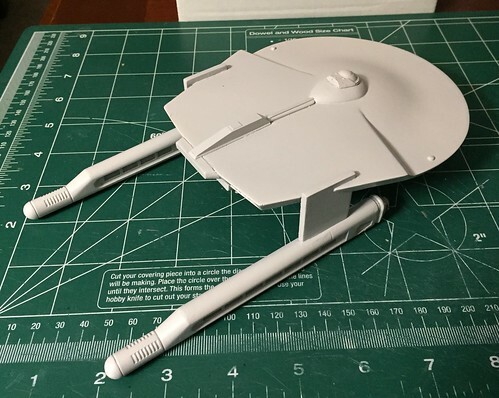 As such, I wanted to go with a very early TMP feel for the design and gave her LN-54 "FleetWing" nacelles, first seen in "Ships of the Star Fleet, Volume One" and sported by the USS Endeavor (sic), a sub-class of the Constitution design. 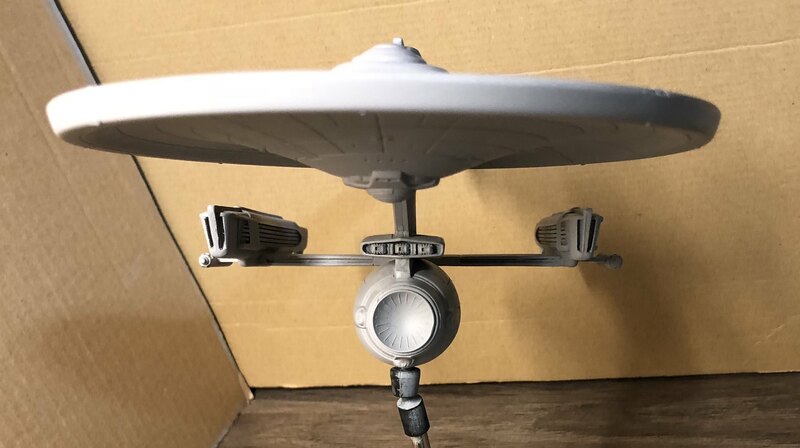 I thought those were some really kewel looking nacelles, which also showed a progression from TOS to TMP in design aesthetics. 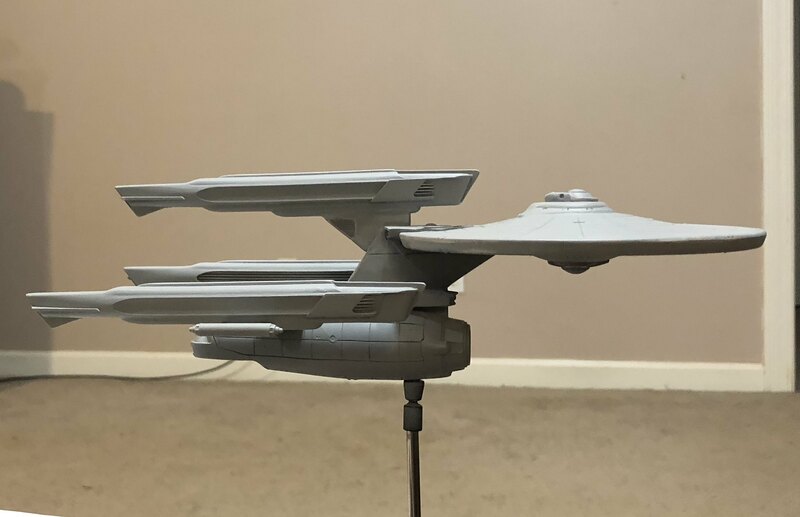 So, I gave Socorro a pair of "Endeavour-Type" nacelles from UGH! Models line of conversion parts. I also gave her a TMP bridge, to show her as more of a later refit style of design. 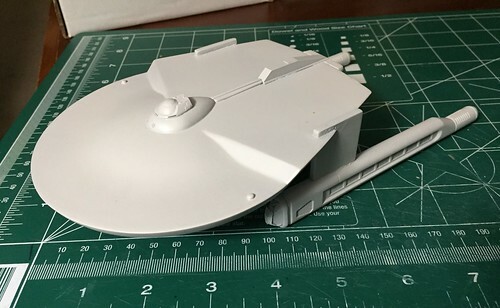 Like the Coventry-class in SotSF, Vol One, I eschewed a sensor dish.I didgo ahead and add an extra deck level on the ventral side. The part used was, I'm guessing, meant to give an alternative to the upper deck part that I used. Looking at the pics from SotSF, it showed what appeared to be some sort of lower additinoal decking, which I interpreted to be similar to that seen on the dorsal surface. I really like this hull and am glad I got a hold of one. The only negative I have on the workmanship itself is one that is simply indicative of all hand-made masters - it's not 100% symmetrical. It's pretty darned close to it, tho! If you can get your hands on one of these, definitely get it. And please share pics of your work! Note the Refit bridge. 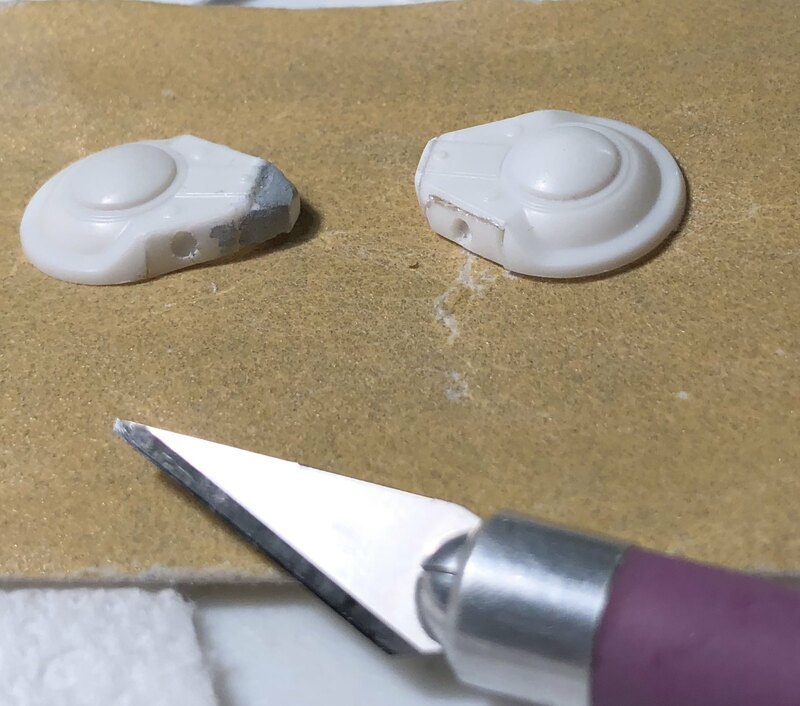 I also drilled two holes on the forward surface of the B/C decks meant to represent AWALT style photorp tubes. 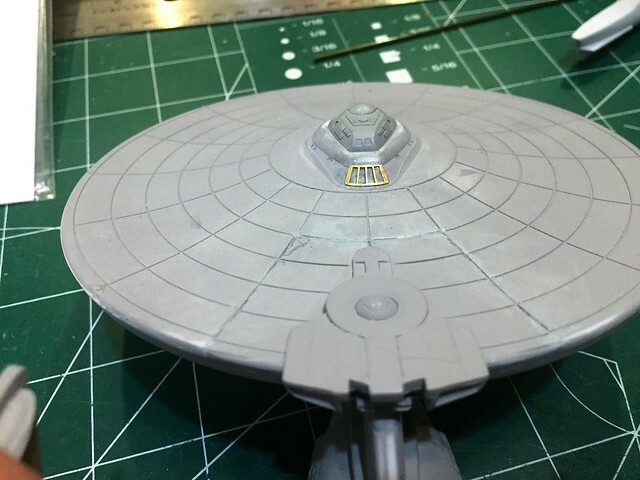 Aft view, showing the lower decks that I added. I call it a photorp deck and so drilled out a hole to represent an AWALT style photorp tube. And custom decals from JBOT. More pics, to include earlier build pics, can be found in the Socorro album on Flickr.